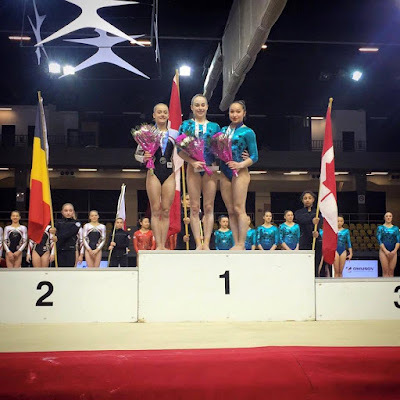 Belgian Gymnastics: International Gymnix: two medals after day 1! 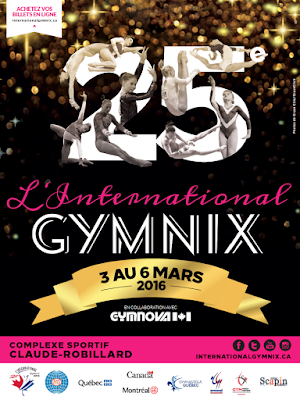 International Gymnix: two medals after day 1! The Belgian Women's team continues its preparation, less than two months away from the Test Event. After an internal competition, the girls flew to Canada and the International Gymnix. And they already shine in Montreal : two medals, including team gold! 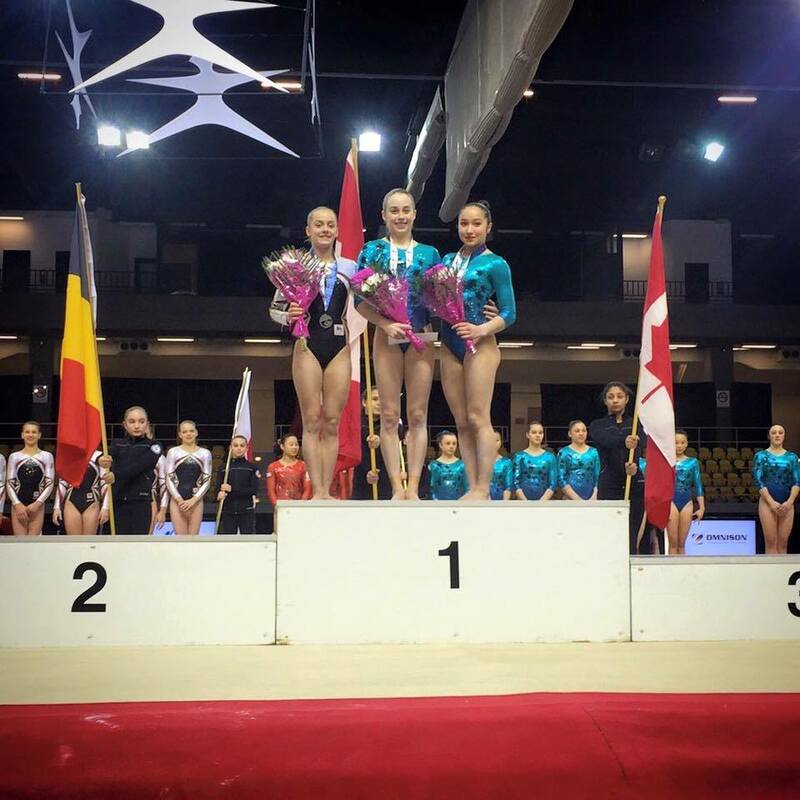 Described as the most promising generation that Belgium has ever known, all eyes were on our gymnasts, including new Seniors, Axelle Klinckaert (GymMax), Nina Derwael (TK Sta Paraat - P. H. H. Hasselt vzw), Senna Deriks (Gymgroep AS) and Julie Meyers (TK Sta Paraat - P. H. H. Hasselt vzw). 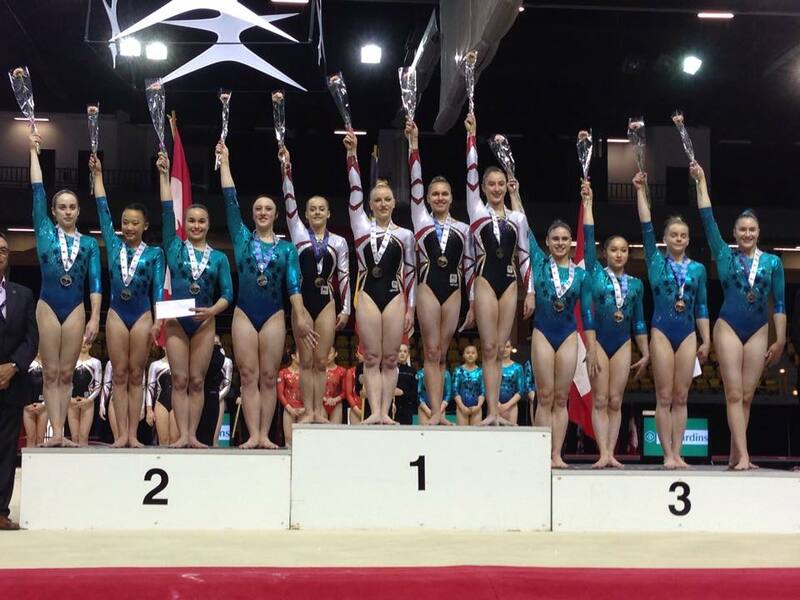 Belgium sent 9 Seniors gymnasts to this prestigious international competition. The first team consists of Laura Waem (Sportiva Sint-Gillis-Waas), Gaelle Mys (OTV Nazareth), Axelle Klinckaert and Nina Derwael. Cindy Vandenhole (Vaste Vuist Lauwe), Julie Meyers, Senna Deriks and Rune Hermans (Gym Haacht) were part of the second team. Julie Croket (GymMax) competed individually. Our gymnasts started on vault, where the Belgians all performed the same vault, a Yurchenko full twist, excepted Julie Croket (handspring front pike, 13.200). Axelle Klinckaert got a superb score of 14.275 and took the lead of the competition after the first rotation. On the uneven bars, Senna Deriks got the highest score for Belgium (14.175), followed closely by Laura Waem (14.050). Unfortunately for Nina Derwael, things didn't go as planned, as she fell at the beginning of her routine. She finished strong with a full-in dismount (13.050). Rune Hermans (13,675) and Axelle Klinckaert (13.725) showed beautiful routines. Julie Croket unfortunately fell on her dismount and only got 11.450. Remember that this is the first time that Julie competes on all 4 events since her injury last September! Nina Derwael quickly got herself back together after her disappointment on bars and got an amazing 14.450 on beam : side somi, back handspring back handspring layout step out, Gainer piked dismount. Gaelle presented a strong routine with just a small wobble (13.600). Laura Waem keeps going and gets the second highest score for Belgium on beam with 13.950. No fall for Axelle either, just a balance check on her side somi but she fights to stay on (13.725). Julie Meyers (13.025) and Cindy Vandenhole (12.275) both fell, as well as Rune Hermans who still got a 13.100! The girls finished their competition on floor exercise, an event that the crowd and fans enjoy very much. Laura Waem is the first to go (13.375), followed by Nina Derwael (double pike, two and a half twist, 13.000). Then comes Axelle: double layout, tucked full-in, double tuck, double pike to finish (14.400). Gaelle Mys got a score of 13.825. She performed a front double twist to a punch front, double back tuck and double pike. Cindy Vandenhole came back strong after her fall on beam and got 12.500, while Julie Meyers came out of bounds. She finished well to score 13.200. Julie Croket had a difficult floor set, as she put her hands down on her last tumbling pass (12.625). Finally, Rune Hermans got a score of 13.450 (double back, one and a half twist to full twist, two and a half twist to finish). 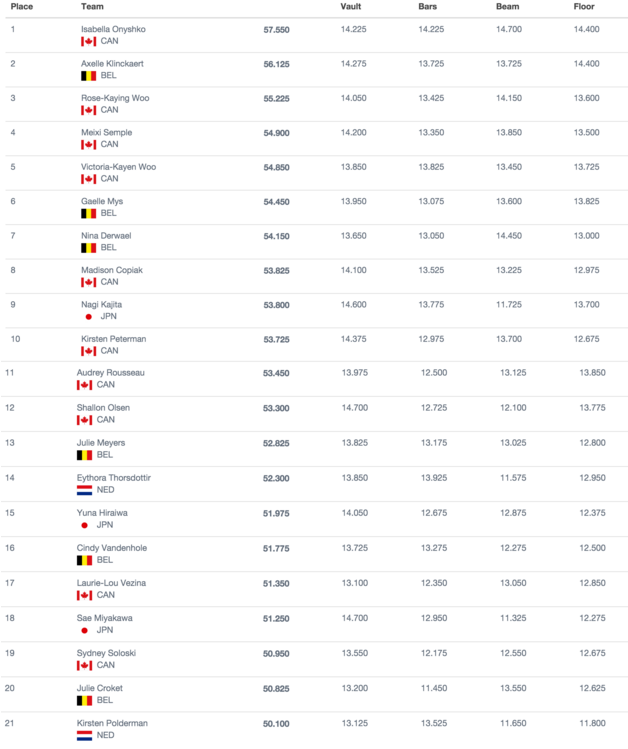 Team Belgium 1 (Klinckaert, Derwael, Mys and Waem) won the team title with 166.450 ahead of two Canadian teams. Team Belgium 2 ranked 5th (158.850). But that's not all as Axelle Klinckaert won a silver medal in the all-around (56.125) behind Canada's Isabella Onyshko (57.550) and ahead of another Canadian girl, Rose-Kaying Woo (55.225)! 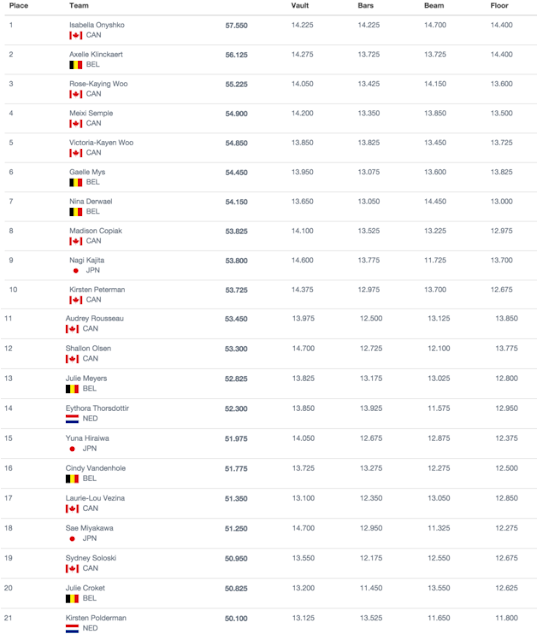 In addition to those beautiful results, Belgium also qualified into 11 apparatuses finals! Of course, there is still room for improvement on the Belgian side, as some of the girls had mistakes, but those results are amazing and encouraging for what comes next : event finals on Sunday. And a friendly meet against Romania and Germany on April 3rd. 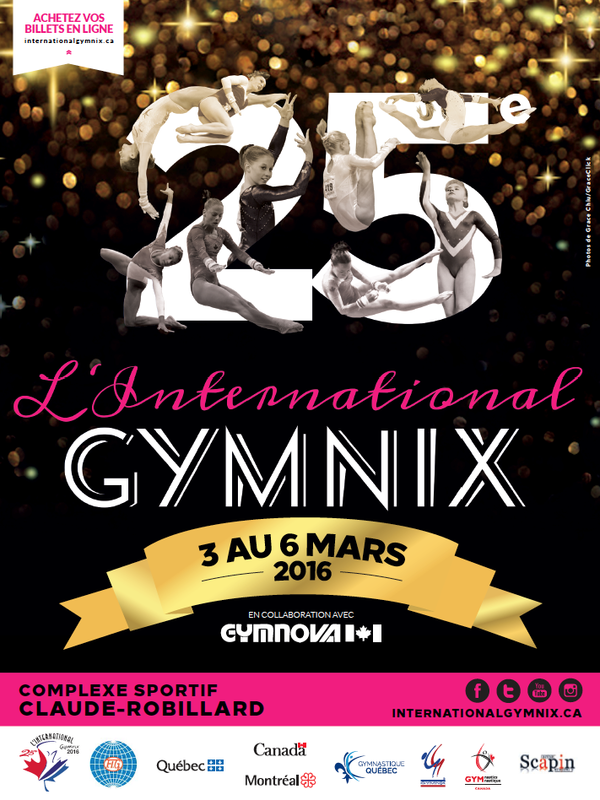 Today, Chloé Leblicq (La Nivelloise) will compete in the Gymnix Challenge competition. Then, Alysha Senders (TK Sta Paraat - P. H. H. Hasselt vzw), Manon Muller (GymPlus), Myrthe Potoms (GymFlex) and Maellyse Brassart (Gym Phénix) will compete in the Juniors Cup competition! DTB-Pokal Team Challenge: all you need to know!